The infamous Halo Legendary edition is back again, though it's not going to come with a helmet this time. 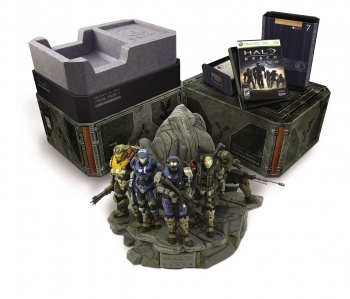 The originators of the humongous collector's edition are back with a new Legendary edition for Halo: Reach. The game will of course come in the regular, sickening $59.99 version, which only includes the gross game disc, but was also announced today to come in limited and Legendary (which must be capitalized) editions. For $79.99, Halo: Reach players can get their dirty mitts on the game's limited edition, which will come in a "recovered 'ONI' black box." One of this edition's bonuses include an exclusive Elite armor set for use in multiplayer, a mode through which users from all over the world can play against each other. It also comes with secret documents such as "Dr. Halsey's personal journal" that will reveal secrets about Halo and such. However, for a mere bag of shells more at $149.99, the Halo: Reach Legendary edition will stomp on your face, make you cry, and then make you apologize. It's going to include everything from the now lousy limited edition, but come in a really super special UNSC-themed box and include a second multiplayer armor set. Todd McFarlane is also going to throw in a pretty beautiful 10-inch tall, 10 pound statue of Halo: Reach's Noble Team members. Unfortunately, just like the Halo 3 Legendary edition's included cat helmet, you can't wear it on your head. This version of Halo: Reach will be in limited quantities, so as much as you might hate to help out your local videogame store employees by pre-ordering, it sounds like a good idea. Notably, the Legendary edition of Halo: Reach will not include the game. Just kidding, it will. I think I still like the bonus in Modern Warfare 2's Prestige edition better, but that statue looks pretty cool. If you bought Halo 3: ODST and simply cannot wait a nanosecond longer for Halo: Reach's beta to begin, as a reminder it will start on May 3. A newly released trailer shows the game in action and details some of the features players will experience in the beta. Halo: Reach is scheduled for release in the fall.